FIBER4 Coming Soon! – Nutrishop Tampa Nutrishop Tampa is a great place to get supplements and vitamins, order by telephone 813-991-9999 today! One of the first steps of making healthy food choices for overall health and wellness is adding fiber to your diet. In today’s busy lifestyle, even people who are consuming fruits and vegetables find themselves short on daily fiber intake. Adding FIBER4™ to your favorite beverage or protein shake is a convenient way to increase your daily fiber intake and support natural digestive tract health. FIBER4™ is unflavored, free of artificial flavors and sweeteners and is sugar-free. In approximately 30 days, Trailhead Nutrition will be releasing a new, exciting product called FIBER4™. A great addition to any protein shake, this product will contain a combination of 4 various types of beneficial fibers along with digestive enzymes, probiotics and contains No Artificial Flavors, Colors or Sweeteners. 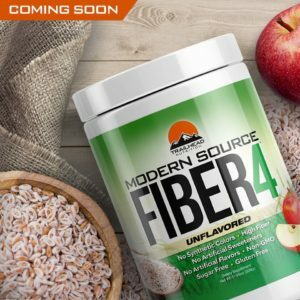 FIBER4™ will stack well with many products as it has a very neutral taste and mixes well!